In my previous article, I showed you an example of simple GridView Example. In this article, we will customize our view. 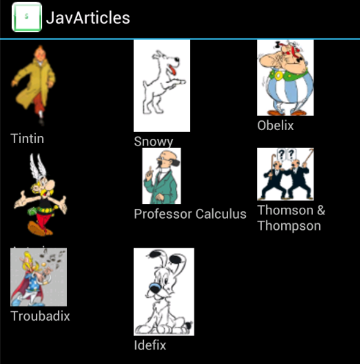 We will continue on our previous example where we have added our favorite cartoon characters to a GridView. We will now customize the grid view, add an image to each character. Our main layout consists just of GridView. Our model consists of bean called Cartoon. It holds the character’s name and the image. CartoonListAdapter is our adapter. It extends ArrayAdapter. We override getView. Here we inflate the custom grid view layout R.layout.cartoon_list_item_view. Let’s review our main activity. In our main activity GridViewExampleActivity, we will set the parent GridView layout. Create CartoonListAdapter object and set the the GridView‘s adapter.